automates the cooling process. It keeps samples cool while occupying very little bench space. Controlling temperature by adding ice chips and repeatedly changing the water is no longer necessary. Quick-connect tubing and fittings are used to attach the chiller to the ports on the cup horn and micro plate horn. Simply set the chiller to a desired temperature, from 2-45°C, and cold water will recirculate through the ultrasonic horn reservoir We have emerged as a dependable Manufacturer, Supplier and Exporter of Ultrasonic Sonicator Bath Chiller in the global market. 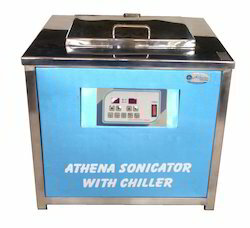 The Ultrasonic Sonicator Bath Chiller, offered by us, is available in various grades and specifications as per the customer requirement. 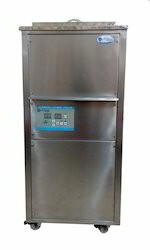 Ultrasonic Sonicator Bath Chiller uses hi-tech Ultrasonic technology during the degassing at laboratory & R & D Lab . 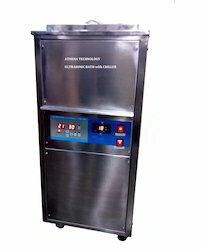 The Ultrasonic Sonicator Bath Chiller is used in pharma industries. Sonicator generates heat which may be harmful to some applications. 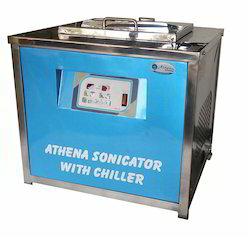 Controlling temperature by adding ice chips and repeatedly changing water is no longer necessary Athena Degassing Ultrasonic Sonicator Bath with Chiller maintain the bath temp. 5 Deg. C & keep sample cool. Simply set the chiller to a desired temperature from 5 - 20°C and cold / chilled water will be re-circulate in the Ultrasonic Bath and it will keep the Ultrasonic Bath temp. cool / chilled with the help of chiller. Powerful chiller to keep the samples cool / chilled. Dissolved , disperse & emulsify samples. Degassing the Sample Solution . 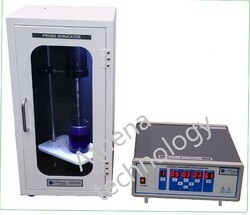 Application Laboratory Sonicator , Scientific Sonicator , Ultrasonic Sonicator Bath . Micro Controller base Digital Timer & Digital Temp. Controller. Extract DNA / RNA, Extract Proteins, Emulsify Liposomes.The amplitude of these mechanical vibrations are magnified by this velocity Horn. Sonication produces high pitch noise that can cause discomfort to the user and anyone in the laboratory. The Sound Enclosure significantly reduces this noise to safe levels. The internal support collar is made to safely hold the converter and probe assembly within the box. The inside of the box is water resistant and the door is made from clearacrylic so you can view your probe and sample. Enclosure Size 34" x 15" x 16"
Timer : Digital Display with 0-99 min settable. Frequency : 33khz ± 3 Khz. Transducers : Imported make PZT type bonded at the bottom of the tank with weld bond technique. Accessories: SS 304 lid, SS 304 Basket, Drain valve & User friendly operation manual. Temperature range 10¿¿C to Room Temp. Max.30°C. We will provide copper cooling coils around outer surface of the tank. Which will be properly insulated & will be connected to a condenser & compressor built-in the machine (Chillier system) this will control bath temperature as per your requirement. Timer 0 to 99 minute’s Digital count down with display. Pulse Sweep Power for Uniform distribution of Ultrasonic energy for ultrasonic tank. Easy to operate and made up of SS 304 (16 SWG) Fabricated tank. Extensive protected generator circuits for longer & safer operation. SS perforated sheet tray type Basket provided. Drain with Ball valve will be provided. Complete Instruction Manual for easy operation will be provided. With Standard supply of LID, basket etc. S.S. ½” OD Cooling Coils inside tank for chilled water circulation and digital temp. controller to set temp, It consists of Chiller unit connected to SS water Storage Tank of above 15 liters capacity to reduce the water temp. to about 15 It has an inbuilt pump & re-circular unit to Circulate chilled water through the SS cooling coils and bring back to chiller unit. This is a table top model and is fitted in powder coated cabinet. Frequency 33khz +- 3 Khz. Temperature range 10˚C to Room Temp. Max.30°C. Enclouser Size 36" x 18" x 17"
Ultrasonic Atomizer, The Ultrasonic Atomizer uses Ultrasonic energy (Low/Medium) to generate low velocity, gentle spray unlike the conventional atomizing nozzle which depends on pressure & high velocity motion to shear a fluid into small droplets. The fluid (Liquid) is dispensed to the atomizing probe by either gravity or low-pressure small pumps & atomize continuously or intermittently as per requirement. The sample can be accurately delivered to the target area & over spray is virtually eliminated thus, resulting in material savings. The atomizer can runs continuously or be programmed to pulse On & Off. The rate of atomization depends within limits solely on the volume that is been delivered onto the atomizing surface & the frequency it operates. Typically higher the frequency, the lower the processing capability. With water the average droplet size is 50 microns and the minimum sample volume that can be effectively atomized is 2µl/sec. To optimize atomization, the viscosity below 50cps & solid concentration must be below 30%. The atomization of liquids containing long-chained polymer molecules is problematic, even in diluted form, due to highly cohesive nature of the material. Drop size is primarily a function of frequency, and the higher the frequency, the smaller the drop diameter, E.g. : frequency 20 kHz the drop size is 100 microns & frequency is 40 KHz the drop size is 50 microns. The Ultrasonic power supply converts 50/60 Hz to frequency electrical energy. This electrical energy is transmitted to the piezoelectric transducer within the converter, where it is changed to mechanical vibrations. The ultrasonic vibrations are intensified by the probe and focused at the tip where the atomization takes place. The liquid travels through the probe, and spreads out as a thin film on the atomizing surface. The oscillating tip disintegrates the liquid into micro-droplets, and ejects them to form a gentle, low velocity spray. Tank Material S.S. 304 Grade Inner & Outer. Ultrasonic Cleaners with Cooling Facility. These cleaners are used to maintain the bath temperature below the room temperature upto 12°C to avoid adding of "Ice Flakes" with inbuilt cooling facility. It helps to control the bath temperature without personalized attention & reduces the chance of damage to process liquid in a professional way. Under the guidance of talented professionals, the offered cleaners are precisely manufactured making use of high quality components and advanced technology. attention & reduces the chance of damage to process liquid in a professional way. 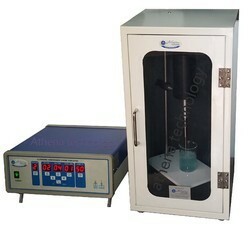 A) Ultrasonic Chamber B) Cooling Components like coils, condenser & compressor of suitable capacity. It has a control panel to control various features of ultrasonic as well as the cooling system. High frequency electrical energy is converted into ultrasound waves by means of ultrasonic Tranducers, which are bonded on the base of S. S. Water Tank. These high frequency sound waves create in the liquid countless, Microscopic Vacuum Bubbles, which repidly expand and collapse. This phenomenon is CAVITAION. These bubbles act like miniature high speed brushes, driving the liquid in to all openings and minutes recesses of the Object immersed in the liquid. Intense scrubbing of Cavitation cleans away all the dirt and soil from the object immersed and the object is perfectly cleaned. It Consist of Chiller unit connected to S.S Water Storage Tank of about 15 liters Capacity to reduce the water temperature to about 15 ºC It has an inbuilt pump & Re-Circular unit to Circulate Chilled water through the S.S Cooling coils and bring back to chiller unit. Construction : Ultrasonic Generator & SS Tranducerised. Tank are housed in one S.S 304 grade cabinet. Transducer : PZT Sandwich type bonded on the base of S.S. Tank. With Transduser Protection for chilled water Condensation. With an objective to fulfill the demands of our clients, we are engaged in offering a wide range of Ultrasonic Bath With Chiller. The system is provided in the Ultrasonic Cleaner and regulates the temperature and keeps the machine in good condition for a long functional life. Keeping in mind the latest market development, the provided system is manufactured by our deft engineers employing supreme class components with the assistance of sophisticated technology in adherence to defined industry standards. Chiller Temp: 5 – 25 deg.cent. Temperature range 12°C to Room Temp. Max.30°C. We will provide copper cooling coils around outer surface of the tank. This will be connected to a condenser & compressor built-in in the machine (Chilling Unit) this will control bath temperature as per your requirement. Jewellery : For all kinds of Jewellery, Precious Stones etc. 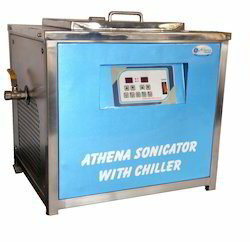 Looking for Sonicator with Chiller ?